(orange square in windows explorer view). Your image has partial transparency which is not supported in the .GIF (or .PNG 8bit) file format, they only support fully transparent or fully opaque pixels. 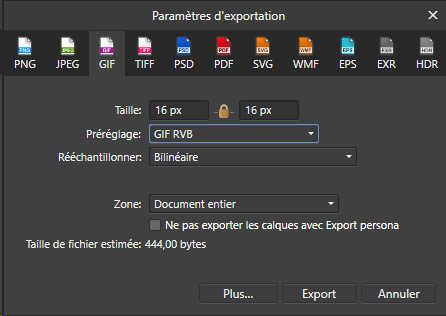 When exporting as .GIF with a transparent matte, the pixels are overwritten as fully transparent, hence it appears there is nothing in the exported image. I'm a little unsure why Windows Explorer displays this as an orange icon, I'll investigate if this is an OS decision or if we need to change something in Affinity. In the meantime, if you require this image in the .GIF format then you will need to export it with a white Matte - this can be set through the 'More' dialogue when exporting. I hope this helps! thanks, you are right, i forget about that. (3D Paint export lol ). or may be this can be an option ? Currently the decision made when exporting is any pixel below 100% opacity is exported as transparent - I'll log an improvement with our developers to improve this in a future build!